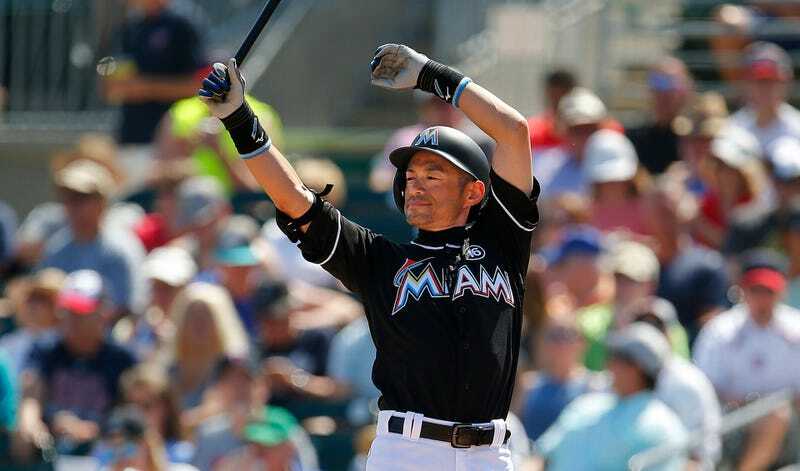 Ichiro On Retirement: "I Think I'll Just Die"
Marlins outfielder/baseball’s True Hit King Ichiro Suzuki is 43 years old, yet he’s not going to stop playing professional baseball anytime in the forseeable future. Last year, he appeared in 143 games and hit .291, and even though the Marlins don’t plan to use him as an every-day starter, Ichiro will once again get his cuts in. The man is a baseball machine. The last time he took one — 2004 or ’05, he doesn’t recall which — was a week-long trip to Milan, Italy. He worked out pretty much the entire time and said the excursion threw him out of sync for two or three weeks. “That’s the last time I took a vacation,” he said. “When you retire from baseball, you have until the day you die to rest,” he said. And when the day finally comes to retire? “I think I’ll just die,” he said.